You are about to become deeply involved with what we are now referring to as �the very first unmissable Olympic Games�. 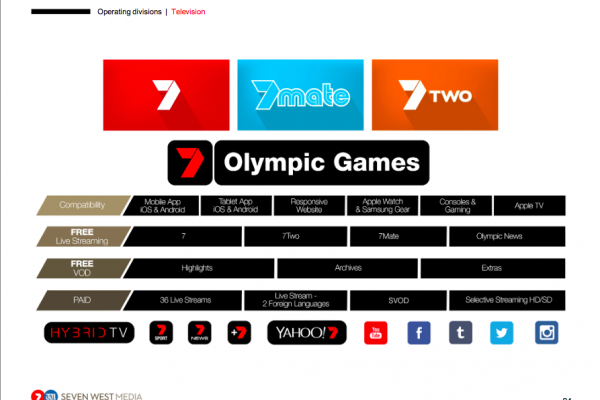 This statement is in reference to the fact that Seven’s Olympic coverage will be practically everywhere, namely across four TV broadcast channels, as well as online and mobile via Seven’s digital properties, including its new ‘Olympics on 7’ app. �The story is similar in the United States, where rights holder NBC�will present an unprecedented 6,755 hours of programming across multiple platforms. Seven will be collaborating with Snapchat via Snapchat’s Live Stories product. The service will showcase�key moments in and around the Olympic Games, via impromptu Snaps from fans, organizers and even athletes in and around Rio events. Importantly,�Snapchat Live Stories will also feature advertisements from Seven�s broadcast partners who will be spotlighted via Snap Ads, up-to ten second full screen vertical video ads interspersed into the Live Stories. NBC’s arrangement with Snapchat will see Snapchat set up a dedicated channel on the mobile app for the Rio 2016 games. According to Bloomberg, media company BuzzFeed will curate short clips and behind-the-scenes content into a Discover channel on the app for two weeks, while Snapchat creates daily �live stories� using content from NBC, athletes and sports fans at the scene. Seven and NBC have also reportedly signed deals with Twitter for the sharing of Olympic content. NBC will also share content on Facebook. Earlier this week Seven announced a further deal, this time with Google, where Australians searching for Olympics in Google Search will see them discover�event schedules, medal counts, athlete information and Seven�s video highlights, amongst other things.�In addition, Seven has created a �7Olympics� YouTube Channel for Australian audiences, where daily highlights, reviews, and commentaries can be found. So when Kurt Burnette says this will be��the very first unmissable Olympic Games� one can understand why, as these traditional media companies are now using social media to engage with younger demographics to ensure that as many eyeballs as possible are watching the Olympics and being exposed to advertisers who are backing the broadcaster’s coverage. Even though this means co-branding of the content with the social media platform. It is exciting to see that broadcasters are happy to share Olympic content through social media because if you are on a social media platform and happen to see highlights of an Olympic event, you may very well then open the broadcaster’s Olympic app or turn on the TV, when you otherwise wouldn’t have. Two weeks of unmissable pure sport is about to begin!